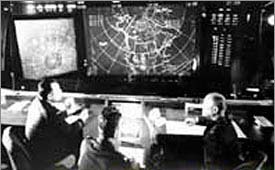 Squeeze in geography lessons while tracking Santa with help from an unlikely organization… NORAD (North America Aerospace Defense) the bilater al military effort between Canada and the U.S. charged with the mission of aerospace warning and control for North America. In 2007, Google signed onto the project as a technology partner, and since then, has been incorporating NORAD’s data on Santa’s whereabouts into special 2D Google Maps and 3D Google Earth representations. Just this week my three year old can pinpoint the Great Wall of China, Prince Edward Islands (South Africa) and Madagascar as she’s been watching the jolly fellow make his way East towards Europe, South and North America. There’s no keeping up with the Jones’ here. This takes it up to a whole new level. Wonder if these guys take their magic to The Playa? I’m keeping the kids from seeing this. Don’t need the pressure. I’m almost waiting for the house to blow-up on queue in a big gas bomb flame out. It’s cool but I’d hate to be their neighbors.